No Comments on Incredible Facts about the Animal Kingdom – How can anyone question there is a God? Recently, as many of my friends will know, we lost a beloved member of our family; our Persian cat Toby. I then began to think about all of his characteristics and what an amazing animal he was – this led to me considering the Animal Kingdom and its perfection – that is why I wrote this message – ‘Incredible Facts about the Animal Kingdom’, found under ‘My Faith, hope…’ section. God has perfected everything He has created – read more to see how; then if you are a sceptic ask yourself – ‘how can there not be a God if all around us is PERFECTION??? ?’ ONLY GOD IS PERFECT! If you are not an animal lover it will be difficult to understand why we are totally ‘moggy’ over our cats. Here is why: I went to pick up a kitten from a Persian sanctuary; whilst I was sitting on the floor fussing the other animals this little ‘runt of the litter’ came to me, climbed on my lap, stretched up and pushed his face into mine. As soon as I responded and cuddled, kissed him, he took action; kissed me continually and claimed me as his own – I returned home with two cats that day! He was my ‘little angel’ from above; he was loving, never jealous of the other cats, playful and not scared of anything. This little boy always purred when we touched him and loved with unconditional trust ‘his mommy, daddy and sisters’. When I was diagnosed with cancer Toby would not leave me alone – he followed me everywhere, comforted me, cuddled me and adored me. Even the chemo did not faze him; animals can smell the poison and will generally keep their distance for a few days – not my boy! He was my darling and I will miss him with all my heart but I give thanks to our Heavenly Father for lending him to me for 11 years; such a blessing. Elephants are the largest animals that live on land. The female’s pregnancy is 22 months, the longest period of any animal. These incredible animals will touch new-born calves and welcome them into the herd; they will also crowd around a dying animal and mourn its death by touching the corpse with their trunks and say their good-byes. A family of meerkats is called a ‘gang’, ‘clan’ or a ‘mob’. The reason for this is they will gang together tightly and stand up on their hind-legs mobbing a predator such as a snake. The reason their tails stand straight up is because they want the snake to focus on their tails and not their faces; if the serpent then strikes it won’t aim for their eyes. They always have a sentry on guard. The older meerkats babysit the pups and if in danger and cannot find a burrow quickly enough; the babysitter will lie on top of the pups and protect them. Another amazing fact about these creatures is that they teach their young how to eat a scorpion. This classroom begins with them introducing a scorpion without its stinger; they are then shown how to attack effectively; the lesson will conclude with them bringing in another scorpion with its stinger – astonishing! Zebras and their stripes??? WOW! Each individual zebra has a totally unique pattern of stripes; this could be viewed the same as the human fingerprint. The stripes are used to camouflage the zebra in the bush. Predators are generally colour-blind and therefore cannot make out the difference between the grass blades and the stripes. Their stripes also assist with cooling them down in the heat; the black attracts radiation therefore the space around the black-stripes is hotter and re-directs the heat down to the cooler air surrounding the white-stripes; this method also confuses predators as this cooling process surrounds the animals in a haze, concealing them from the predator. 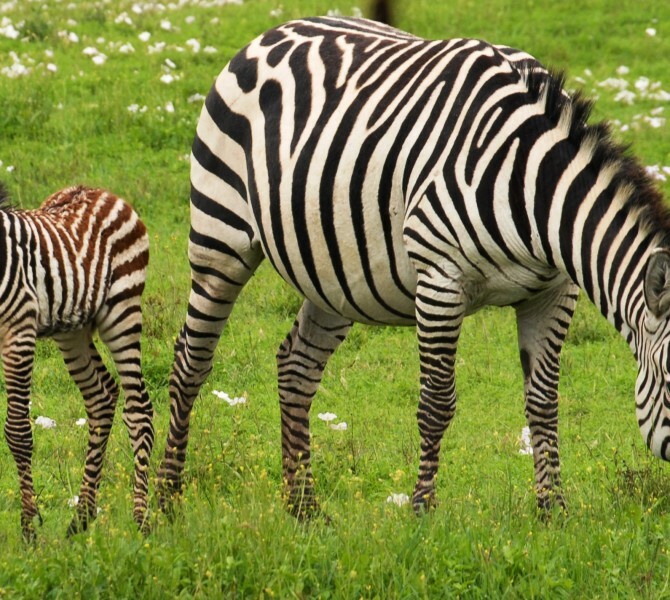 My last interesting fact about the Zebra – when a foal is born the other zebras stay away from the mother and baby for approximately two days; the reason for this is that then ‘mum’ and ‘new-born’ can recognise each other’s stripe-patterns and smell. How can anyone question there is a God? Nature surrounds us with His glory and every microscopic detail, as far as the human body is concerned and the animal kingdom is perfection, therefore GOD MUST BE PERFECT!